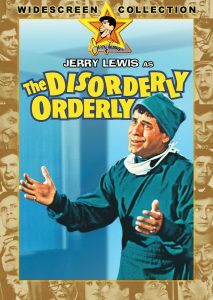 In The Disorderly Orderly, Jerry Lewis plays the part of Jerome Littlefield, a would-be medical student who has dropped out of school due to his extreme case of sympathy pains—whenever a patient discusses his or her symptoms, Jerome begins to feel the malady himself. In addition, he finds himself pining for the girl that he fell in love with in college. She doesn’t know that he exists (Susan Oliver). To the distress of one of the nurses (Karen Sharp), who has fallen in love with Jerry Lewis’ character. Frankly, I was more than pleasantly surprised by Jerry Lewis’ ”The Disorderly Orderly”. I hadn’t seen the film in nearly 30 years and remembered very little about it. It was not only funny, it tugged at the heartstrings in just the right amounts. Not too much to become sappy, and not too much screen time to detract from the comedy. It also features a very nice social satire in the context of a board room meeting, which was both funny and pointed. having a fight with his girlfriend in the “quiet” area of the hospital. All of the supporting cast works very well, including Kathleen Freeman, who appears in many of Jerry Lewis’ films, this time as the antagonistic Nurse Higgins, who is being driven to the brink by Jerry Lewis’ character’s well-meaning attempts at hard work, that keep backfiring on the suffering Nurse Higgins. The finale deserves special mention: a chase scene reminiscent of a Looney Tunes cartoon. It hasn’t been surpassed or equaled since. The finale alone is worth the price of admission, but the entire show is a gem. I rate it 4 out of 5 clowns. The hugely successful collaboration between Jerry Lewis and director Frank Tashlin (including Artists and Models and The Geisha Boy) came to an end with this knockabout hospital comedy, which contains a raft of Tashlin’s patented sight gags. Jerry plays an orderly with a strange fixation on a depressed patient (Susan Oliver), but the point of the movie is watching Lewis wrestle with laundry bags or contorting with agony as he empathizes with the intestinal maladies of patients.